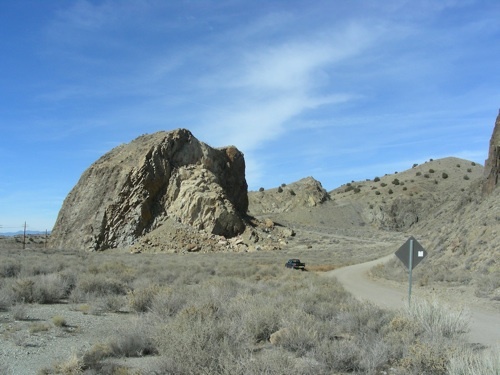 At first you might find it hard to believe, but the State of New Mexico has a greater variety of volcanic features and volcanic rocks than any other state in the country, including Alaska and Hawaii. It’s true we don’t have any actual erupting volcanoes – at present – but we do have rocky records of just about every kind of igneous activity that can occur on the continents. 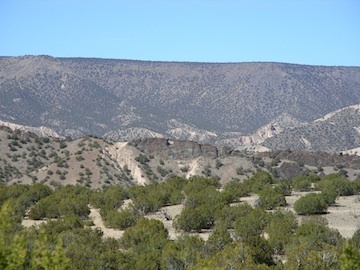 Among these records are structures that seem to catch everyone’s eye while driving through the New Mexican countryside, or hiking in our mountains: igneous dikes and sills. 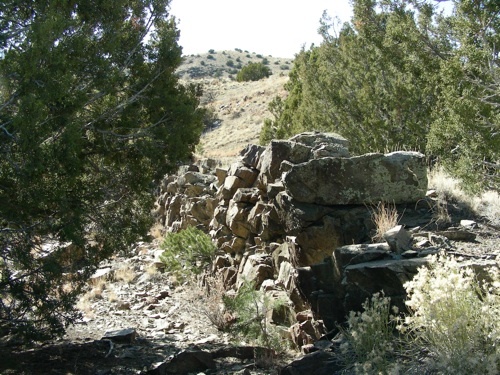 Visually, a dike looks like a natural wall of stone, sort of like a dam – or dike. A sill appears on a hillside or cliff face as a horizontal band of stone, like a window sill. 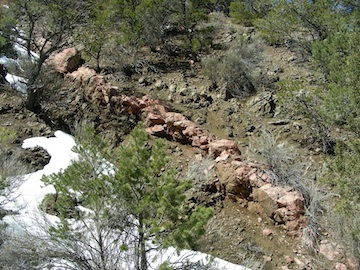 Since both dikes and sills are originally of subterranean origin, some sort of regional uplift and/or erosion must have taken place to expose them at the surface. 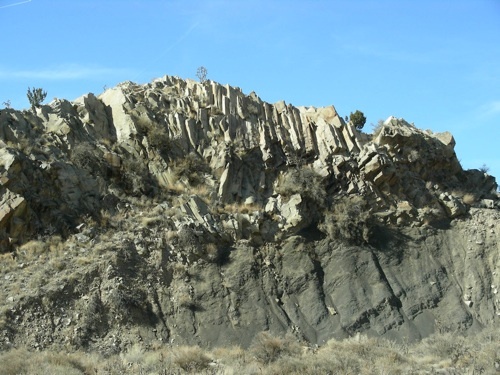 Dikes and sills are intrusive igneous structures. Intrusive means they intrude upon – or more exactly, intrude into – their surrounding rocks. Igneous literally means ‘born of fire’, and it refers to the rocks that make up the dike or sill, which were originally melted and incandescent when they were intruded. And structure is one of those useful, multi-purpose words that refers to something with boundaries. This dike was nowhere near the Earth’s surface when it formed. Miles of crustal uplift and miles of corresponding erosion were required for us to see this. 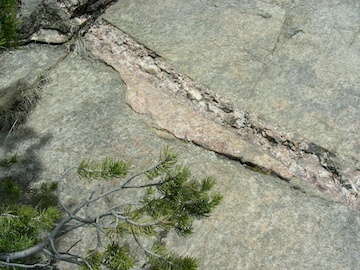 Similarly, sills are sheet-like bodies of magma that have cut across pre-existing rocks, but in a way that parallels the original structure of the rocks they cut. 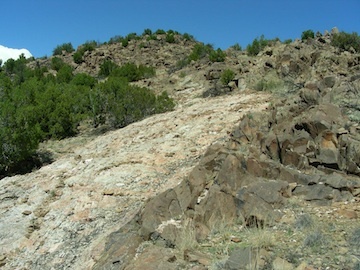 The magma forces itself along a bedding plane in the sedimentary rock it is intruding, or between beds of tuff and lava, laid down earlier, or along the foliation planes of pre-existing metamorphic rock. Very typically this intrusion is in the form of a horizontal sheet. 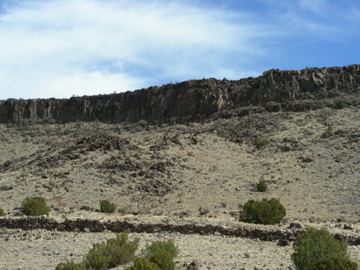 The magma bakes the rocks both above it and below it, which is one way geologists distinguish sills from lava flows. 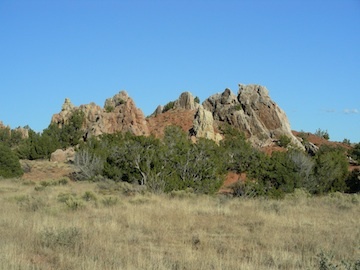 The Devil’s Throne in the Cerrillos Hills. This entry was posted in Nature&history and tagged geology, hiking, igneous, mountains, nature, New Mexico, outdoors, volcanic. Bookmark the permalink. Great article Scott, I had no idea Devil’s throne was a tilted sill.